Tranquillityite: Mineral information, data and localities. Named in 1971 by J. F. Lovering, D. A. Wark, A. F. Reid, N. G. Bunch, A. El Goresy, Paul Ramdohr, G. M. Brown, A. Peckett, R. Phillips, Eugene N. Cameron, J. 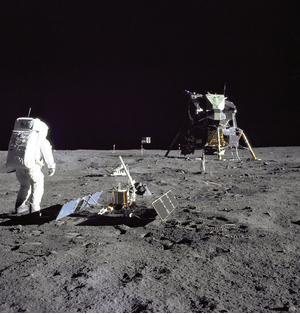 A. V. Douglas, and A. G. Plant after its discovery locality at the Sea of Tranquility, the Moon. American Mineralogist (1973) 58: 140-141. Proceedings of the 8th. Lunar Scientific Conference (1977) 2: 1831. Rasmussen, B. et al (2012) Tranquillityite: the last lunar mineral comes down to Earth. Geology, 40(1), 83-86. Rasmussen et. al, 2011, Tranquillityite: The last lunar mineral comes down to Earth, in Geology, January 2012; v. 40; no. 1; p. 83–86. Rasmussen et. al, 2011, Tranquillityite: The last lunar mineral comes down to Earth, in Geology, January 2012; v. 40; no. 1; p. 83–86. ; Hickman, A.H. (1978) Nullagine, Western Australia: Geological Survey of Australia 1:250,000 Geological Series Explanatory Notes, 22p. Rasmussen, B., and Fletcher, I.R. (2004) Zirconolite, a new U-Pb geochronometer. Geology, 32, 785-788. doi:10.1130/G20658.1. Rasmussen, B. et al (2012) Tranquillityite: the last lunar mineral comes down to Earth. Geology, 40(1) 83-86. U. Bläß, F. Langenhorst (2011): High-pressure phase transformation of SiO2 polymorphs to Seifertite. Joint Meeting of the DGK, DMG and ÖMG, Salzburg, Austria, September 20-24, 2011; Abstracts Volume, p. 46.
ⓘ Dhofar 301 Lunar meteorite (Dho 301) ? El Goresy, A., Ramdohr, P., & Taylor, L. A. (1971). The geochemistry of the opaque minerals in Apollo 14 crystalline rocks. Earth and Planetary Science Letters, 13(1), 121-129. Meyer, H. O. A., & Boctor, N. Z. (1974). Opaque mineralogy-Apollo 17, rock 75035. In Lunar and Planetary Science Conference Proceedings (Vol. 5, pp. 707-716).